While calls for education reform have become more frequent and increasingly urgent in recent decades, substantive, large-scale changes to teaching and learning in our schools remains elusive. Many notable reform efforts, driven often by external authorities and influences, have failed to consider and meaningfully engage the education leaders and classroom teachers charged with their implementation. Julie Wilson’s book is a gem of wisdom and common sense that illuminates this often-overlooked human dimension of changing education in ways that can really make a difference for learners in our school systems. 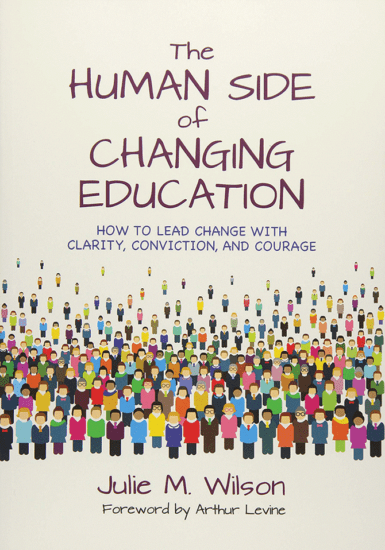 The Human Side of Changing Education offers a thoughtful, experience-informed road map for education leaders grappling with the challenge of education transformation. Based on the premise that when we ask organizations to change, we are really asking the adults working in them to change, the book focuses on the implications of this reality for the K-12 education system. Citing growing consensus about the skills and habits required by students to thrive in a world that is complex, diverse and ever changing, Wilson outlines the pedagogical and cultural shifts necessary in schools to achieve this kind of learning. The book lays out different approaches to change, critical success factors and strategies for leading change through collaborative endeavour across all levels of the education system – school boards, administrators, teachers, parents, students and the community at large. The final chapter speaks to one’s personal journey of learning in the change process and the common path experienced by change leaders, both within or outside of the formal education system. Questions concluding each chapter invite thoughtful reflection and deep conversation about the why, the what and the how of educational change. The book’s companion website provides additional information, resources and stories from the field attesting to the power of human-centred leadership in effecting meaningful and lasting change in schools. At a time when many past education reform efforts have failed, Wilson’s book provides practical tools, strategies and resources, enriched with real-time examples of field-based educators engaged in leading successful change initiatives. It is an essential read for those with the passion and the heart to engage in the hard work of education change that matters. Become a member of the EdCan Network to enjoy a discount on this book and many more.